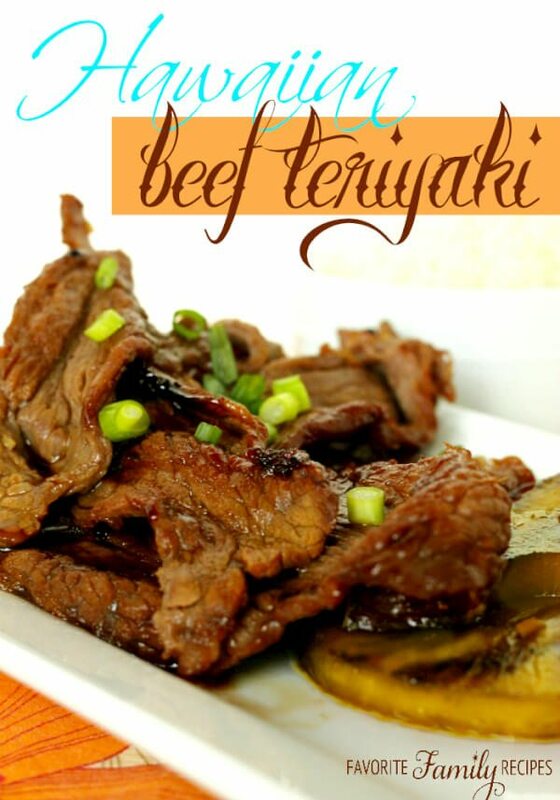 Hawaiian beef teriyaki is a favorite of mine from when I lived in Hawaii. The teriyaki sauce is out of this world good. Great with a plate lunch! love love love beef teriyaki! It was one of my FAVORITE meals to eat when I lived in Hawaii. I seriously can’t get enough of this stuff. 1 can pineapple chunks with juice 15 oz. Mix together all ingredients, excluding beef. Set aside about 1/2 c. of the sauce, cover and refrigerate. Place beef in a Ziploc bag and pour marinade over. Press out all the air, seal, and marinate for at least 6 hours (overnight works great). Over prepared grill on medium-high heat, grill steak a minute or two on each size until cooked to your desired doneness (with the steak being so thin, you don't have to grill it for too long). Place beef in a large bowl, pour remaining sauce over the cooked beef and stir until well covered. Serve with rice (or grilled fresh pineapple). *you can use sirloin steak, cut into chunks. Thread marinated beef onto skewers and grill. My family loved this! Especially my husband and my mother-in-law (they are Samoan). Wonderful recipe. Question??? Is the minced ginger a spice or you actually bought ginger? Can it be done with a ginger spice? I like to use the REAL stuff, the flavor is better. I am sure you can use the ginger spice though. Just remember to use a little less because it has been dried. This was awesome! My family loved it! Made this last night and it was a big hit, even my usually anti beef six year old had seconds. What do you do with the pineapple chunks from the marinade? Could you grill them? Can you substitute the pineapple for something else due to being allergic to them, if so what would you suggest best?? You can leave it out or if you want a citrus flavor you can add a little squeezed orange and a touch of orange zest! Sorry to ruin your suggestion about the orange juice or zest but this person may also be allergic to citric acid such as oranges, lemons, grapefruit, etc. but not necessarily. My oldest Daughter is allergic to the aformentioned fruits but not pineapple. The person with the pineapple allergy needs to be tested for fruit allergies. Good luck. Do you warm up the reserved sauce before pouring over the cooked meat? This recipe sounds fantastic and I will be trying tomorrow! You don’t need to, but you definitely can if you want! Can I use chicken thighs with this marinade? Yes, they would be great! Do you have something smaller like a Foreman grill? If you don’t have a grill you can use a large frying pan, wok, or skillet– you just won’t have the smoky grilled taste. Hope this helps! It should serve 4-6. Hope this helps! Another wonderful teriyaki recipe! I’m excited to try it. Tonight I’m making your Hawaiian teriyaki chicken recipe. Excited! !i love Hawaiian foods thank you! Also my favorite “street” food from when I lived in Hawai’i. Thanks for the recipe. You ar very welcome! Let us know how this recipe compares to the recipes you have tried in Hawaii! Can I just use pineapple juice? I haven’t tried it that way, but I don’t see why not! Let us know how it works if you try it!